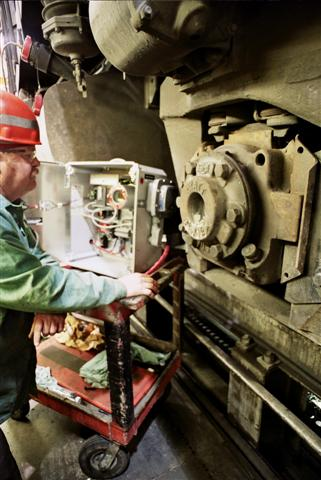 A sophisticated mobile gas detector is slashing turnaround times for repairing locomotive fuel tanks from days to hours at Burlington Northern/Santa Fe’s Northtown shops in Minneapolis. Developed by Sensor Electronics, the unusual gas detector makes sure diesel fume concentrations in the tank are well below the lower explosion limit (LEL) during hot tank repairs. The gas detector eliminates the costly and time-consuming job of draining and flushing the tank before welding work. The self-contained gas detector console can be wheeled anywhere in the shop, plugged into any convenient electrical outlet, then put to work. This gas detector zeroes in on only diesel fumes, ignoring other gases as well as dust, dirt, oily mists, condensation and arc welders. The tank is first carefully inspected, and any cracks or holds chalked. Then the welder floods the tank with liquid carbon dioxide, to smother any possible combustion. Then he snakes a flexible tube from the gas detector console into the fuel tank’s return line. A pump in the console pulls a continuing sample of tank air back to the gas detector. Because the detector is sensitive only to diesel fumes, it ignores the CO2 as well as other contaminants. Digital readouts on the console give second-by second reports on fume levels inside the tank; in addition, lights on the console stay green – meaning he can continue welding – as long as the fume levels are below 5 per cent LEL, giving an excellent safety margin. If fumes hit the 5 per cent LEL mark, console lights turn from green to red, and the console turns on alarm lights and a penetrating klaxon. For additional protection, the console swirls a constant stream of liquid CO2 into the tank to flush out any pockets of diesel fumes. Cost of the entire mobile console – gas detector, pump, sensing probe, filters, alarm lights, even the klaxon – came to well under $10,000. For Burlington Northern/Santa Fe a wise investment – faster tank-repair turnaround at a negligible cost.